Stickvise is a low profile vise designed for PCB soldering. 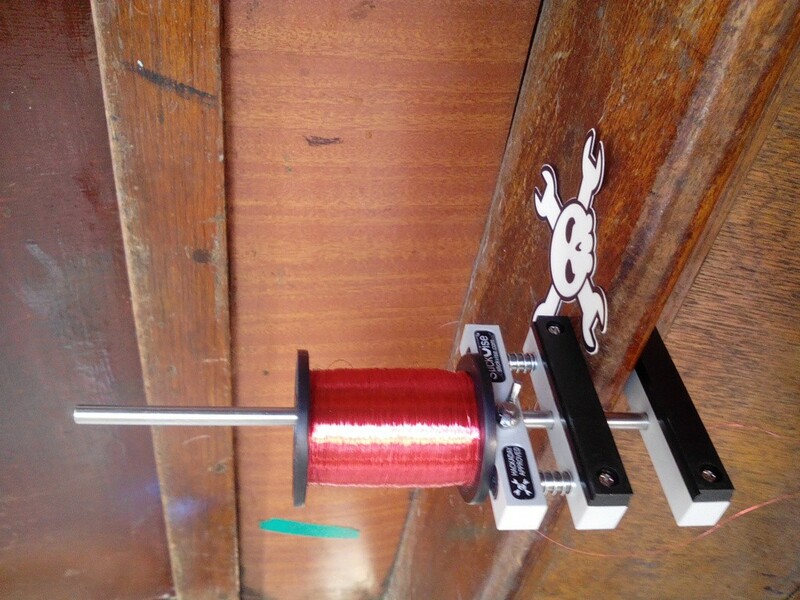 This product was born on Hackaday.io. This project was created on 10/31/2014 and last updated a year ago. Thanks to Hackaday for helping me make this a product! They sold the first 1k Stickvises through their store, although it is no longer being sold there. Stickvise is a low profile soldering vise that addresses several problems with PCB holders and vises currently on the market. 1) Most soldering aids are too tall, requiring your hands to hover in the air while soldering. 2) Most soldering aids are not capable of holding a flat object parallel to the table top, making it difficult to work under magnification without losing focus as you slide the subject around. - With the wing nut loose, the movable jaw can slide to any position along the shaft. - To grab a circuit board, gently squeeze the jaws against board edges. - Tighten wing nut to fix the movable jaw. Stickvise comes with the basic components shown in the picture below. Scroll down to see some ideas for ways to enhance, customize and hack your vise. If you have a 3d printer, you can download and 3d print some of the jaw designs that I have come up with. Finally if you have a custom idea, use my OpenSCAD script to design yourself a set of custom jaws, you can then 3d print or send out to have them made. I have designed the code to generate models such as the ones below by changing a few parameters at the top, no learning curve or coding knowledge necessary. Make your Stickvise into a big spring loaded cupholder. This is one jaw, so two will need to be printed. I spilled coffee on myself two days ago, so I decided to design some cupholder jaws for Stickvise to help me avoid this situation in the future. Now you too can make your Stickvise into a neat cupholder with this new set of jaws. Stickvise has a new distributor in Canada - Buyapi.ca. They are the largest distributor of Raspberry Pi merchandise in Canada and now they stock Stickvise! This should be a more cost effective option than ordering from a US distributor for all interested Candians! I am using a very inexpensive Shapeoko 3 to produce precision milled PTFE jaws for Stickvise from my basement! Why don&apos;t I have the part molded or machined somewhere else? I project sales of about 200 pairs per year. Molding PTFE is a specialized process because of the very high temperatures, so it would only be warranted at higher volumes or if I could justify a much higher price point. Machining is more typical in this volume range, but outsourcing machining was still too expensive. To hit the price point I wanted and not commit to large manufacturing runs, I chose to get a machine to make the parts myself. This also meant I could justify having my own CNC at home, which I had wanted for a while. I&apos;m happy to say the machine is working well and has already paid for itself. Most importantly, I have a new toy that I never would have bought otherwise. This is exactly the kind of thing I had in mind for Stickvise - mod and hack to make custom fixtures for holding PCBs. These are a cool set of jaws by @bfesser that not only hold two RasPi zeros, but you can flip them around and hold any size PCB. There is actually a dual and a single jaw set available. Enjoy pics below, if interested in 3d printing these, head over to thingiverse to download. After over a year of selling through the Hackaday Store I have expanded to add a new distributor - Adafruit! Super excited to expand the Stickvise audience, Adafruit is a really cool company. They did an amazing job on photographing Stickvise, check out some of the shots they took! Better than any I have taken for sure. Also on the Adafruit product page you can see a great video of Limor and Phil talking about it a little bit. Ben Heck Show Stickvise sighting! I sent Ben Heck a Stickvise a couple months ago, I thought it was a long shot to even get a response but I wanted to at least give it a try. You have to put yourself in his shoes, he probably gets tons of unsolicited crap shipped to him every week that people hope will make it into one of his videos. It turns out he was really nice, even sent me a thank you email when it arrived and told me that he was using it a few minutes after it arrived. Very cool of him to do that. I noticed in the show&apos;s latest video (covering the completion of his Hackmanji game) that Stickvise was on his bench in the background the whole time. Not sure what he&apos;s holding in the vise but it&apos;s an honor to see it being used! Still brainstorming the idea of using Stickvise for PCB milling. After a brief chat on Twitter with Danielle Applestone (owner of Other Machine Co. makers of the Othermill) I was inspired to delve further into this possible application. The main issue is full slotting, particularly parallel to the edges of the jaws where the PCB is most likely to slip. This morning I did some testing to see how Stickvise would handle this. Below are the results, not a bad start - didn&apos;t have movement in any of the five test boards I cut out. Sorry for the absolute bush league mistake of putting my finger over the lens, that&apos;s embarrassing. You can see more about the jaw design I&apos;m using in this older project log. Ok everything went well today, I cut all of my blank material (made like 135 pieces, or 67.5 pairs) using a table saw, that worked great. Then I used my fixture to make 12 pairs of PTFE jaws. It&apos;s not a blazing fast process, I am going to have to be careful how I price these things as I could easily see myself wind up working for $2 per hour if I go too low. Check it out, fixture is done. I milled the aluminum on a Tormach 770, really an excellent machine. One fun thing about CNC is you can do things that wouldn&apos;t be feasible on a manual mill. I decided to go in and chamfer all of my edges using a Maritool 90 degree chamfer mill. You can see in the pics below there are perfect little beveled edges on everything, even the circles. It would have been overly tedious to do this on a manual machine, so you invariably would have hand filed. Nothing wrong with that technique, just doesn&apos;t look as cool! On top of that, I had some fun adding a bead blasted finish just to top it all off. I use an inexpensive Grizzly sandblast cabinet, and some fine glass bead media that I bought from McMaster years ago. This final step really makes tool marks disappear and leaves a nice matte finish, didn&apos;t need to sand or polish anything. (2 years later). The stickvise&apos;s at my workplace are still going strong with daily wear and tear, you&apos;ve made an excellent product. Cool, thanks for the note! Glad it is still working for you! Any idea when they&apos;ll be back in stock on store.hackaday.com? Yes! They are in production now, scheduled to ship out on Nov 30 so they should be back in stock in December. Sorry, thanks for inquiring - they didn&apos;t order more from me until the store went totally out of stock. Better planning next time. BTW - I need to check out your talk, looks interesting. Wish I had been able to go to supercon. Please do! And let me know if there&apos;s anything you&apos;re interested in learning more about. I expect the video to go up soon. Looking forward to adding it to my bench! Did my first PCB with my own diy Stickvise yesterday. It&apos;s awesome, soldering will never be the same again. I&apos;m all for it, please share your build! Anyone who wants to make their own should do it, those who don&apos;t have the tools will find it easier to just buy one. Great!, I just added mine. I think you&apos;ll like it. I will write a bit more detailed &apos;user experience&apos; log later. Thanks for making this awesome project/product. I ordered 2 and took one to work, ended up ordering 3 more. I think you should consider a production run of the latest interlocking jaws if the shape isn't overly complex for manufacture. Thanks for ordering a bunch and for the feedback Reed! It is great to hear people getting good use out of Stickvise. I do like the interlocking jaws, I might consider getting some made at some point, I wish there was an easy way to do it. I would have to order in fairly high bulk to make the price reasonable. Requires some cash investment. Maybe I will try a small kickstarter at some point for various accessories. haha cool, hadn't thought of using it like that. Thanks for the pic! Just bought one--looks like a great product, stoked to ditch my Helping Hands! wow, I'm glad you like it! thanks for the stellar review, I will see if I can get hackaday to tweet it out for me. Thank you Alex for this very nice tool. I like it, because it can be modify. I won it with my project for ESP8266-Modules. Thank you Alex for design this awesome PCB holder. I think its useful for all maker. I won this from HAD for my project on MPPT controller. Thanks, your project is awesome very well explained so that someone who is not an electrical engineer can understand it (like me). I hope you get good use out of your Stickvise! Yeah it will be very helpfulI for me.I am eagerly waiting for its arrival. Awesome! thanks for the skull and follow - please let me know about your experience once you have used it a bit. I just received mine and it's awesome ! Sweet! Thanks for the skull/follow/feedback! Test it out in as many ways as you can and let me know what you like and don't like. Just wanted to say congrats on getting to market Alex. Hope it does really well for you. I've been using mine and I absolutely love it. Don't know how I went so long without a PCB vice now! Thanks Ben! It has been such a fun experience, couldn't have done it without you and others believing in it! Cool, I was just at NoVa Labs yesterday dropping off a couple of demo vises. Cool, I got a ton of hits on my website from that email blast. @Bob Coggeshall is a great guy - I picked his brain about my project for a couple of hours the other day. I'm hoping to get more involved at NoVa labs, wish I lived a little closer though. I've seen Ben Heck NOT using this. You should sell this to him - he was soldering a board seesaw style :) I'll definitely order one next time I'm in America! Thanks Dave, I am putting together sample packs to send out to hopefully get reviewed by a few people here and there. I will see if I can send him something. Very nice product, It has 'why didn't I think of this' written all over it. Thanks! I hope it takes off, I am having so much fun with this. Did the Stickvise make it to you? Interested to hear how it is working for you. No, not until now. It's still on its way. The tracking of the parcel says that it has left Frankfurt Airport on Friday (which is just a hour away from me). I assume that it will arrive during this week after it has (hopefully) passed the customs office unattended. Otherwise I will have to pick it up at the customs office and pay the tax to pick it up. I will definitely give you a response after I have played with it. Today I have picked up my Stickvise from the customs office. I have played a little with it and I can say you that I already added it to the list of my favorite tools. It is very practical and easy to use. I also love the simplicity, there is not a single piece to much its just exactly what is needed. Thank you very much for that great idea! I've added some M3 plastic screws to the M3 threads on the bottom if the vise to avoid scratching the table. Awesome, thanks for the kind words, so glad it made it to you and you like it! i'd love to add this to my work bench as well. Hope you do crowd fund. Thanks @Fidel salinas. I am not crowd funding but the product is in production now, should be available in March if manufacturing goes smoothly. Follow the page, I will update as soon as it becomes available. Hi Alex, do you have any idea when and where I can by one of these? Cool project but how do you prevent the plastic from heating up when using hot air? Hot air soldering would melt any plastic I know of and the frame (aluminum) seems to me to be the sort of thing that would conduct the heat right into the plastic (as well as the board which can get 300+ degrees). I've seen folks use a plastic folding table for soldering and the hot air literally melted the table rendering it warped. Yes you're right even PTFE melts when doing heavy hot air rework. One time we were doing something similar and actually had the laminate on the table top blister and suddenly rupture. A steel jaw option is definitely something to consider to expand the uses of the vise. The nylon jaws are good because they won't short anything if you want to power something up and probe around. Thanks for your thoughts, I think that definitely makes sense. Good call, a brief google search shows you can actually machine ceramic. Maybe that would be a cool jaw option. @technolomaniac - Hey Matt, did some hot air tests today, check out my project log. The nylon held up reasonably well. Will try to see what it takes to test it to failure tomorrow maybe. Home & office organization products. From idea to manufacturing and everything in between. Learn how to use PID loops for fun: SAB3T - Servo Actuated Ball Bearing Balancing Touchscreen. You are about to report the project "Stickvise - low profile soldering vise", please tell us the reason.